SmartButler enables you to listen to your incoming messages without reading them and to recognize your online friends by their voices. 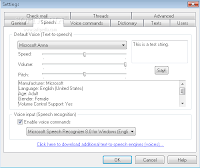 It uses Microsoft Agent and Speech technologies to read incoming ICQ, MSN Messenger, Yahoo! Messenger and AOL Instant Messenger messages audibly. SmartButler can read messages from users with different voices and languages, using different speed, volume and tone settings set up for each individual user. It also understands slang and idioms, will let you know when you have new mail, and can read the clipboard automatically.